Sweatcoin Review – Is This New Mobile App Actually Legit? These coins can then supposedly be traded for things like clothing, experiences, goods & services & even products like Apple watches & iPhones… But is Sweatcoin legit? Or will you be breaking a sweat for nothing? Sweatcoin itself is a cryptocurrency, similar to Bitcoin which is something that you might be familiar with. However Sweatcoin differs to Bitcoin in the sense that coins are not released through “mining”, instead they’re released through sweating… (kinda). You see Sweatcoin offer a mobile app which when downloaded to your phone tracks your GPS & your walking activity. 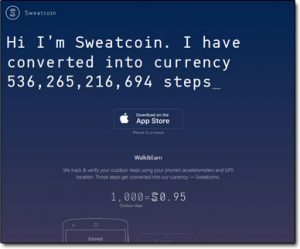 If you activate the app & sign up to Sweatcoin then you’ll begin earning Sweatcoins simply by walking around. Though the important thing to note here is that your activity does have to be outdoors, that’s why Sweatcoin need access to your GPS – to determine whether you’re inside or out. So any walking around inside that you do won’t be counted, instead your Sweatcoins will start racking up once you step outside. You can start racking up Sweatcoins (also known as SWC) the very same day you download the app – all you need to do is head outside & start walking. The app runs in the background & it will automatically start tracking your activity once it detects you’re outside. Every 1,000 steps will bag you 0.95 SWC (Sweatcoins). You’re also presented with the opportunity to earn an additional SWC each day by logging into the app & watching an advertisement. This is optional, but it’s certainly a lot easier than walking an additional 1,000 steps. Sadly though if you think this app is going to see you to riches then think again. Sweatcoins are not directly exchangeable for cash & also their value isn’t so great. It will take a LOT of walking before you can claim anything even remotely worthwhile through the app. If you share the app with your friends you’ll also get 5 free Sweatcoins for every one of them that signs up too. As far as I’m aware there’s no limit on this either so if you’re popular then this could potentially be a pretty good way to kick-start your SWC balance. What Can You Get For Sweatcoins? This bit will likely be the make or break for you, and I know for many it will likely be the break. Whilst Sweatcoins is a pretty cool app in concept, as you can imagine it’s not all that rewarding… In fact as you’ll see in a moment some of the “offers” don’t really seem like offers at all. So yeah, firstly as I mentioned above you can’t directly exchange your Sweatcoins for cash which is the biggest bummer, but that’s kinda the “catch” because the app generates revenue from advertisers & so you’re forced to pick “offers” from them instead. Well except for the home workout subscription at least, but the problem with that one (and the other subscriptions like it) is that they require your credit card details so if you end up forgetting to cancel then you’ll actually end up losing money rather than making it. They do provide some better things like real gift cards & PayPal withdrawals but these take a LOT of Sweatcoins to access. And when I say a lot I really mean it – it would likely take you a whole year of walking 10,000 steps per day before you’re able to cash out the $50 they offer through PayPal. It’s safe to say that you’re not going to get rich with this app! Before I run over some of the complaints people have been mentioning about Sweatcoin the first thing I want to point out here is that the app is free, and that essentially they’re giving you bonuses for stuff you’d likely be doing anyway… So whilst there are indeed some complaints about Sweatcoin I think it’s pretty fair to say that it’s not all bad. But anyway yeah, here’s a few of the things people have been complaining about.. Battery life – because the app is constantly using your GPS in the background many people have been complaining that it has significantly started reducing the battery life of their phones. I can’t confirm whether or not that’s actually the case myself but it does sound fairly legit. Mobile data – I’ve seen reports of people seeing an increase in their mobile data, likely because the app is communicating to Sweatcoins servers. This means you need to be careful because depending on your data package it could actually end up costing you more than it ever makes you. Poor rewards – the majority of the complaints do tend to gear towards the rewards with people claiming that the app is “pointless” and that it takes far too long to earn anything that’s actaully worth having. They also complain about the lack of variety because until you rack up a whole bunch of SWC you’re restricted to the offers provided by the advertisers. Outdoors only – the app only activates & starts counting your steps when you step outside, so if you work indoors & think that you may be able to quickly rack up a whole bunch of steps think again. You’ll need to get out there & face the elements before you start gaining any SWC. Coin limit – you’re only permitted to earn a certain amount of coins per day. This limit increases as you unlock new membership levels through the app (which happens the more you walk) but ultimately a limit on how much SWC you earn per day is not so great. My Verdict – Is Sweatcoin Legit? Well I’m confident in saying that the app is definitely legit, however whilst it’s a good idea in concept & could be a pretty good app down the line, I don’t think at this moment in time I’ll be personally recommending it. Also there’s a big problem in my opinion with the “free” subscriptions that are offered through the app. I agree that it’s good to get free access to something even if it’s just a month or so but the issue is that you have to provide your credit card details & you’ll end up getting billed if you forget to cancel. 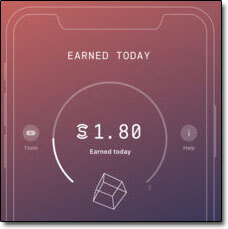 One forgotten subscription could set you a back a whole year (or more) of walking with Sweatcoin… I personally therefore wouldn’t touch these subscription based offers with a bargepole (and wouldn’t really recommend you to). But yeah overall as far as I’m concerned & based off the other Sweatcoin reviews I’ve found online the app definitely seems legit so if you are an avid walker then by all means try it out but just don’t expect the world. Insta Profit Hack System Review – Scam By Joseph Paul? It Sure Doesn’t Look Legit! Is The Wealth Network a Scam? Read My Honest Review Before Signing Up! Transcribe Anywhere Review – Scam Course or Legit Way To Learn Transcribing?